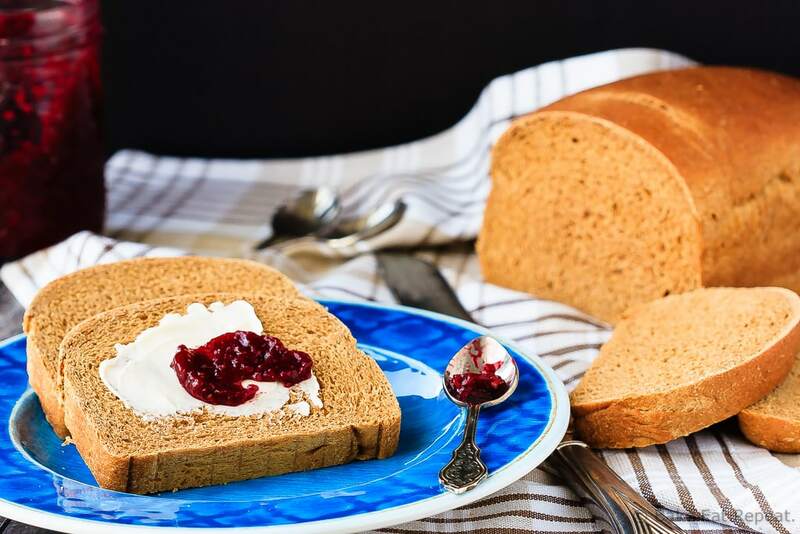 Icelandic Brown Bread Recipe - from Bake.Eat.Repeat. Easy to make, slightly sweet, soft and perfect for your morning toast – this Icelandic brown bread is amazing. You need to try it! So, anyone out there ever had Icelandic brown bread? Yeah….didn’t think so. This maybe isn’t a recipe that the masses are clamouring for. But you know what? They should be. 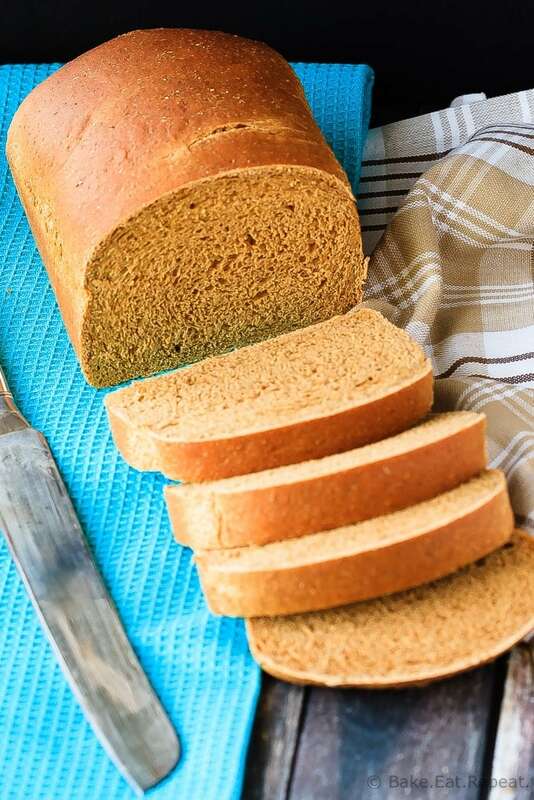 It’s a fantastic, easy to make, brown bread that is a bit sweet, super soft, and just perfect for your morning toast. So why Icelandic brown bread? Well, because I’m part Icelandic and so I had it fairly often growing up. My grandma’s family is from Iceland, although I’ll be honest, I haven’t really had a ton of Icelandic food. There were the few things that we would have at my Grandma’s house whenever we were visiting, but that’s about it. And occasionally my dad would bring home some dried fish and he and I would happily inhale it (being the only two in the house that actually liked it! As a side note, I haven’t had that in years – I wonder where I can find it?). I have a couple of Icelandic recipes from my Grandma, although I haven’t yet attempted to make my favourite of all, a cake that she made every Christmas. It’s so good though, and I might need to try making it this year, just so that I can share it with you! The one I make on a regular basis is this one – Icelandic brown bread. This recipe was from my great Aunt, and was originally meant to be made in a bread machine. But I never did really care for the strange square shaped loaves that you get out of a bread machine and so I haven’t used one in years. If you prefer to use one though, this recipe works well on the whole grain setting – it will make one large, 2 pound loaf. I like it as two smaller 8×4 inch loaves, made in bread pans. Either way, it’s the perfect bread for toast. We love it toasted for breakfast with peanut butter or jam. 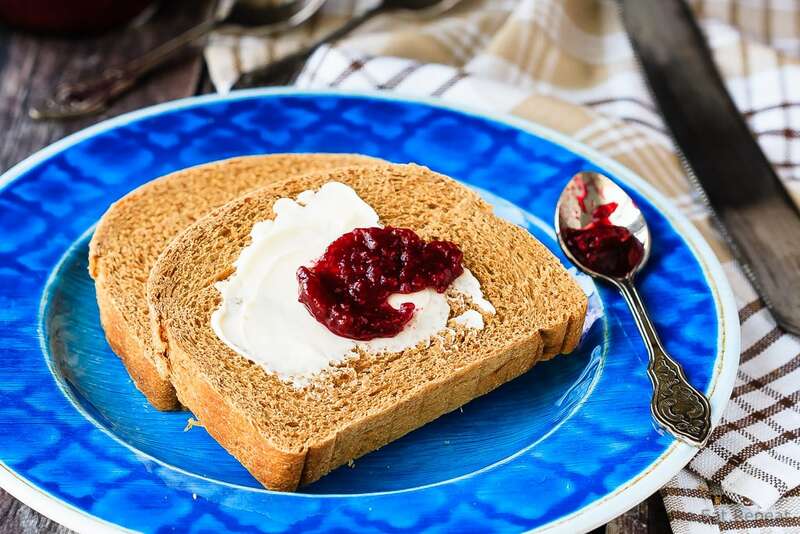 Even if you haven’t grown up with Icelandic brown bread – you will love it. It’s fantastic! Easy to make, slightly sweet, soft and perfect for your morning toast - this Icelandic brown bread is amazing. You need to try it! In the bowl of a stand mixer with the dough hook attached, or in a large bowl with a wooden spoon or dough whisk, combine the water, butter, sugar, brown sugar and molasses. Add the salt, all-purpose flour, 2 1/2 cups (350g) whole wheat flour and the yeast. Mix with the dough hook until everything is combined. After mixing for a minute or so, the dough should come together and clear the sides and bottom of the bowl. If it is too wet and sticky to clear the bottom of the bowl, sprinkle in a little more whole wheat flour, a tablespoon at a time, until the dough clears the bottom of the bowl. It should be soft and slightly tacky to the touch, but not overly sticky. Knead the dough for 8-10 minutes (12-14 by hand) until it is smooth and elastic. Remove the dough to a lightly oiled bowl, turning it to coat, and cover tightly with plastic wrap. Allow it to rise until almost doubled, about 2 hours. Punch down the dough and turn it out onto a lightly oiled surface. Divide it into two pieces and shape each into a loaf. Place each loaf into an oiled 8x4 inch bread pan and cover with plastic wrap. Allow the loaves to rise for 45 minutes to 1 hour, or until they have almost doubled. Preheat the oven to 350 degrees F. Bake the loaves for 50-60 minutes, or until browned and cooked through. Turn out onto a wire rack to cool completely before slicing. I have a small amount of skyr, recently brought to me from Iceland. I understand it can be used as a sort of "mother" to make home-made skyr. Any suggestions on recipes? I wish I could help you out there, but I've never actually had skyr, let alone made it. Although now I want to! Hi Caroline - a few people have actually emailed the name of the place in Gimli that you can get it from! And my dad is going to be there this summer too, so he'll grab me some I'm sure. But thanks! Which church is that? I live about 4 blocks from a (former) Icelandic church here in Minnesota. I love this! And I would love to know of other Icelandic recipes. Thank you! So, I've never tried Icelandic Brown Bread before but I'm so intrigued! This loaf looks absolutely perfect Stacey! I love that there's brown sugar and molasses in this too, it sounds amazing. Hi Stacey, If you really want some hard fish, you can get it in Gimli, Manitoba - used to be the center of what was called "New Iceland." I also have some Icelandic brown bread recipes. I use the traditional yeast (for your recipe it would be 1/2 tbsp and 1/2 c. warm water and pinch of sugar - sit 10 min.). Also, I scald 1 1/2 c. milk and then add the molasses, salt, lard and brown sugar, adding the yeast mixture. With less yeast, the bread is a little heavier, but makes heavenly toast! I sometimes use multigrain flour in place of the whole wheat, and it turns out nicely. I also make vinarterta and ponnokokur, which I'm sure are in your family recipes! Yummy! Thanks Wanda, someone else actually emailed me telling me that Gimli is the place to get it - if I'm ever nearby I'll have to do so! I've used multigrain flour in mine too, and love it, and toast is always our favourite with this bread. Vinarterta and ponnokokur are two of my favourites. Haven't had either in a while but I've been meaning to try out my Grandma's vinarterta recipe, that's one I've never actually made myself! I've never had Icelandic brown bread, but you can bet I'm going to make it...STAT. It looks perfectly delicious!